Gable Symmetrical: A ridged (double slope) building in which the ridge is off-center. Gable: The triangular portion of the endwall from the level of the eave to the ridge of the roof.. Designers have the capability of arranging sidewall columns that are straight or columns with the more economical tapered section. Flexible design providing for maximum utilization of interior space. Our plant fabricates all main framing in accordance with the company’s strict AISC quality certification guidelines. The benefit of the quality fabrication practice of Empire is the reduction in building assembly labor, and subsequently lower erection cost. Interior support columns available as either pipe sections or H sections. Wider buildings are feasible more economically. Empire Steel frames come with welded subassemblies. 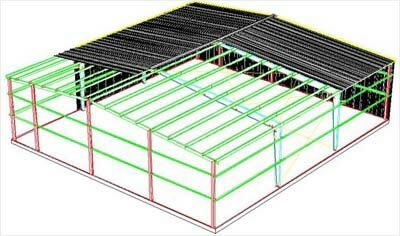 Roof purlin support plates and wall girt support plates are factory welded to the main frames. Saves erection time and increases the overall stiffness of the building. Purlins are supported laterally by the welded plates. Reduces the amount of purlin roll experienced under heavy loading. Empire Steel furnishes all structural bolts with a corrosion protective plating. Improves the appearance of the building and helps to speed up erection process, and no more rusted bolts to contend with. Frames are prefabricated as much as possible. Eliminates costly field work needed to “customize” the frames for specific building configurations. Endwall frames can be simple post and beam type construction, or can be built with a full interior type rigid frame to accommodate future expansion. Endwalls are furnished in a variety of configurations, again with the flexibility to meet any need.